Julian has been asking when school starts since the last week of school. We are now down to 20 days before our life goes back to schedules. They only attend two days a week, but love going. We will miss the teacher they had last year, but I am sure we will be just as pleased with the next one. This is the last year I have with them before Kindergarten and I want to cherish all our time together. It is hard to believe they are 4 years old and that Julian is telling me he wishes I named him David, after David in the Bible. Julian wants a sling shot like David had, so we are going to make one. We finally found a stick I think will work. My aunt is going to help us with the other parts, I just hope he does not kill any animals! In order to get one he had to learn how to spell his last name. Now we just need to work on writing it. We are now off to Splash Country to enjoy what we have left of the summer, between storms. I know I will miss these precious times and their loving attitudes. I hope I remember these sweet times, when they become teenagers and do not want to be with me! This past weekend we went to the home of Brian’s former boss. He invited us as well as the Crichlow family. Roberto and Brian worked for Jerome Julian at SunTrust Bank and they both always thought the world of Jerome. We were all excited to enjoy a relaxing weekend at the lake, but most importantly have fellowship with Jerome and his lovely wife Stacy. Roberto and his wife Sandra, who we are friends with, have two girls whom our children have great fun with. Their home is just beautiful and welcoming so much so that Julian wanted to know when we were moving to the Lake when we got home. There is just not a bigger compliment when a child is ready to move in with you! Julian would wake up before Brian and I and instead of coming to get us he just headed down the stairs to be with Jerome and Stacy. The last morning I found Julian snuggled right up to Jerome watching Mickey Mouse Club House. The Julian family was a delight to be with and we all wish we could live on the lake! The day my tubes were removed in December 2001, was also the same day Brian was on a conference call during my surgery in which his boss, Jerome Julian, announced that he would be the head of a different section of the bank. So Brian has always remembered the two as the worse news ever. Brian was blessed to have Jerome as a boss, when he first moved to Business Banking and I am sure he would love to work with him again if it is in God’s plan. When the twins were born, Brian got to name one and I was going to name the other. We were told at one point we were having a boy & a girl, then we were told we were having two boys, then we were told we were having a boy & a girl. So we were not sure what to expect. Brian had decided on Natalie if we were having a girl. I had decided on Julian and Jeremiah for two boys, but I was not sure if we had a girl and a boy. So when the girl came out, Brian told them her name, but was not able to tell them the boy’s name, so he was known as Mr. Bailey for many days. Brian kept asking me what I wanted to name him, and all I could do was think about how I was going to survive this. I was very ill and in excruciating pain from not just a C-section, but my bladder was almost completely severed and my parts were all out of place and the doctor tried to move them to the correct spot. I was just thankful I was alive, I could not think beyond that. I also was not able to hold or see them for several days since I was so ill. The photographer from the Knoxville News Sentinel knew this and made many print offs of the pictures she took when the twins were born. When I saw the picture of my baby boy, I knew he looked like a distinguished gentleman, so I had to name him after my father, Julian David Morrow. I also wanted to name my son after his father as well, so I joined the two together. Julian David Keene Bailey, but Brian said that was too long and that I had to choose between David and Keene. Julian Keene Bailey it became. Brian said everyone at his work thought it was so nice we named him after his boss and my doctor, Dr. Keenan. We thought that was funny. But both men have had a great impact on our lives and Julian is blessed to be named after them as well. This summer has been jam packed with activities. 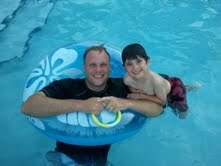 As a family we try and visit Dollywood Splash country several times a month, like we did for Father’s Day. With such warm temperatures, anywhere with water has been the place for us this summer! Vacation Bible School has also been a big part of our summer. The twins attended three different ones and wanted to know this week if we were going to another one. They enjoy going to them since they do not have preschool in the summer. They sing all the songs and really soak up God’s word as they bring it all into their daily play time. It is really such a blessing to see how they enjoy learning the word of God. July is also a month of many birthdays and celebratory activates. Mine is the first, which is Canada day, in honor of my Canadian Mother! The fourth of July, is also a big time in my family. We got together with extended family for fireworks while swimming in the pool. Julian has decided he wants to be a “fireworks guy” when he grows up followed by a “zip line guy.” I have tried to explain to him that zip lining is not a career choice, but a hobby. Julian does not seem to care, he still considers that a great job to have when he grows up. I did tell him that when he gets old enough we will go together. Another celebration this month is cousin Alyssa’s birthday. We were invited to a family birthday party for her as well as a kid’s party! We all had a great time eating cake, cake balls, ice cream, icee’s, and many more wonderful treats! We also got to honor, our friend, Sasha, on her birthday as well, with a fun day at Doe River Gorge. At the end of this week we will also be celebrating and honoring the life of Brian’s grandmother, who passed away this past Sunday. She was just one day shy of her 100th birthday. I will be speaking at her funeral and have been thinking about her life and what I will say. It is a great honor for me to speak about such a fine Christian woman, but even more of a privilege to call her family. I have learned so much from her walk with the Lord and look forward to teaching my children about her love for God as they have a better understanding of what it means to be a Christian. What a role model and a legacy she leaves behind for all of us to honor. As I speak at her funeral, I cannot help but wonder, who will be speaking at mine one day. Will it be Julian or Natalie’s child’s wife or husband, if I am blessed to live that long. Will they have such fond memories of me and my walk with the Lord? At times like these I often have to look and see where I measure up and make necessary changes in my own life, so that my own children will be able to say “her children rise up and call her blessed,” Proverbs 31:28. What a great weekend we have had. It was my birthday and we celebrated at my sister’s house and then went to the Alcoa pool. When I grew up I went to that pool almost every day. It brought back lots of wonderful memories. Julian wanted to go off the diving boards as well, but I told him we would have to ask his swim teacher before we did that. The twins are taking swim lessons and are doing great. Natalie can swim across the pool with her head above the water, which is what the teacher wants. Julian swims under the water and does not want to put the effort it will take him to swim with his head above the water. So I am hoping his desire to go off the diving board will entice him to work harder. The other day Julian checked the weather on the phone and said, “It has three numbers! That means it is a lot, lot hot!” Yes, here in our area it has been a lot, lot hot! Patty’s sister sent a care package for the twins with books for them to do on hot days. Those days are currently here! Julian asked the other day if it was Christmas yet. Natalie also asked how many days were left before Christmas morning. We may all be wondering that due to this unusually hot weather, but the weather has nothing to do with the twins countdown. On Friday, when we got the care package, we went out to get the ingredients in the Princess cookbook to make butterfly cupcakes. We are looking forward to making some wonderful princess desserts. So bring on the hot days, we are ready to cool off with treats and swimming!